"Self-forgetfulness is the reigning temptation of the technological era. This is why we so readily give our assent to the absurd proposition that a computer can add two plus two, despite the obvious fact that it can do nothing of the sort--not if we have in mind anything remotely resembling what we do when we add numbers. In the computer's case, the mechanics of addition involve no motivation, no consciousness of the task, no mobilization of the will, no metabolic activity, no imagination. And its performance brings neither the satisfaction of accomplishment nor the strengthening of practical skills and cognitive capacities." In this insightful book, author Steve Talbott, software programmer and technical writer turned researcher and editor for The Nature Institute, challenges us to step back and take an objective look at the technology driving our lives. At a time when 65 percent of American consumers spend more time with their PCs than they do with their significant others, according to a recent study, Talbott illustrates that we're forgetting one important thing--our Selves, the human spirit from which technology stems. Whether we're surrendering intimate details to yet another database, eschewing our physical communities for online social networks, or calculating our net worth, we freely give our power over to technology until, he says, "we arrive at a computer's-eye view of the entire world of industry, commerce, and society at large...an ever more closely woven web of programmed logic." Digital technology certainly makes us more efficient. But when efficiency is the only goal, we have no way to know whether we're going in the right or wrong direction. Businesses replace guiding vision with a spreadsheet's bottom line. Schoolteachers are replaced by the computer's dataflow. Indigenous peoples give up traditional skills for the dazzle and ease of new gadgets. Even the Pentagon's zeal to replace "boots on the ground" with technology has led to the mess in Iraq. And on it goes. The ultimate danger is that, in our willingness to adapt ourselves to technology, "we will descend to the level of the computational devices we have engineered--not merely imagining ever new and more sophisticated automatons, but reducing ourselves to automatons." 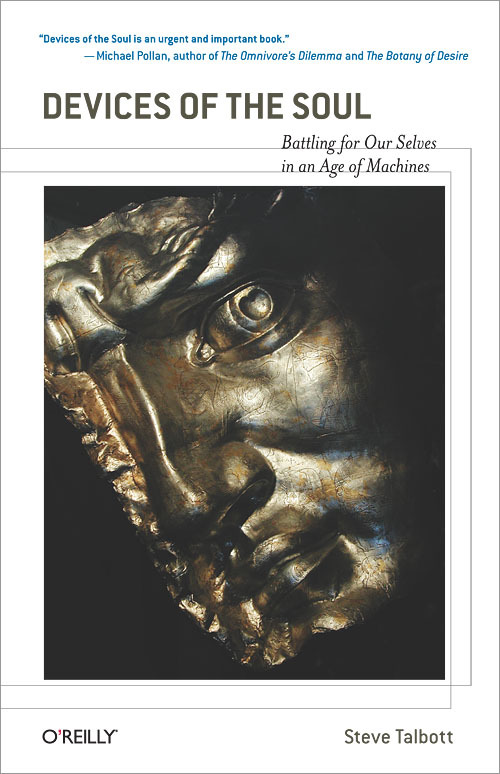 To transform our situation, we need to see it in a new and unaccustomed light, and that's what Talbott provides by examining the deceiving virtues of technology--how we're killing education, socializing our machines, and mechanizing our society. Once you take this eye-opening journey, you will think more clearly about how you consume technology and how you allow it to consume you. "Nothing is as rare or sorely needed in our tech-enchanted culture right now as intelligent criticism of technology, and Steve Talbott is exactly the critic we've been waiting for: trenchant, sophisticated, and completely original. Devices of the Soul is an urgent and important book." "Steve Talbott is a rare voice of clarity, humanity, and passion in a world enthralled by machines and calculation. His new book, Devices of the Soul, lays out a frightening and at the same time inspiring analysis of what computers and computer-like thinking are doing to us, our children, and the future of our planet. Talbott is no Luddite. He fully understands and appreciates the stunning power of technology for both good and evil. His cool and precise skewering of the fuzzy thinking and mindless enthusiasm of the technology true believers is tempered by his modesty, the elegance of his writing, and his abiding love for the world of nature and our capacity for communion with it. " "Those who care about the healthy and wholesome lives of children can gain much from Steve Talbott's wisdom. He examines the need to help children spend more time touching nature and real life and less touching keyboards. He eloquently questions the assumption that speeding up learning is a good thing. Is, after all, a sped-up life a well-lived life? Most importantly, he reminds all of us that technology is just one part of life and ought not to overshadow the life of self and soul." "One of the most original and provocative writers of our time, Steve Talbott offers a rich assortment of insightful reflections on the nature of our humanity, challenging our own thinking and conventional wisdom about advances in technology." "Are you experiencing growing unease as computational metaphors have seized our discourse? Steve Talbott offers immediate relief. You are not losing your mind! Chapter after chapter, he shows how to draw on the powers of technology without losing your soul or breaking your heart." "Steve Talbott is a rare writer whose words can alter one's entire perception of the world. He is our most original and perceptive defender of the wholeness of life against the onslaught of mechanism. Devices of the Soul is written with Talbott's typical grace and clarity. It displays a quality hardly found anymore in our high tech culture--wisdom. " Where Does the Wild Live? Chapter 4 Can Technology Make the Handicapped Whole? Chapter 7 Why Is the Moon Getting Farther Away? How Do You Simulate Life? Chapter 15 Invisible Tools or Emotionally Supportive Pals? Do Cell Phones Make Us Safer? Will Lie-Detecting Software Make Us More Trustworthy? Not Solutions, But a Strengthening of the "I"